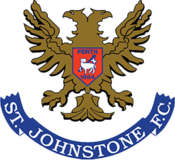 St Johnstone Football Club is a professional football club in Perth, Scotland. The name of the football club derives from St. John's Toun – the old name of Perth. Although it is officially recorded as being formed in 1884, the club did not play its first game until February 1885. The club's home since 1989 has been McDiarmid Park. The club's first Scottish Cup appearance was in 1886–87 and they joined the Scottish Football League in 1911–12. St Johnstone won the Scottish Football League First Division, the second tier of league football in Scotland, in 2008–09. This gained them promotion to the Scottish Premier League, bringing a return of SPL football to McDiarmid Park for the 2009–10 campaign after a seven-year absence. The club have historically floated between the top two divisions of Scottish football, obtaining the reputation of being a "yo-yo club". Their traditional rivals are the two Dundee clubs, Dundee and Dundee United, with matches between St Johnstone and either Dundee club being called Tayside derbies. The club has had limited success in cup competitions. After losing at the semi-finals stage on numerous occasions, the club won their first Scottish Cup in 2014 with a 2–0 win against Dundee United. It has reached two Scottish League Cup Finals (in 1969 and 1998), losing them to each of the Old Firm clubs. They have also won the Scottish Second Tier seven times, the Scottish Challenge Cup in 2007, the B Division Supplementary Cup in 1949 and the Scottish Consolation Cup in 1911 and 1914. They have qualified for European competitions on seven occasions (four seasons consecutively from 2013 to 2016). Their highest league position in the top division was third place on three occasions, 1971, 1999 and 2013. For season-by-season statistics, see List of St Johnstone F.C. seasons. Chart of yearly table positions of St Johnstone in the Scottish league. The club was formed by members of the local cricket team seeking to occupy their time once the cricket season had finished. The cricketers were kicking a football around the South Inch, a large public park beside the River Tay during the autumn of 1884. This is widely acknowledged to be the date of the formation of St Johnstone Football Club, although it was not until early in the following year that a group of footballers, led by John Colborn, held an official meeting that led to the formation of the club as a separate entity rather than a 'spin-off' of the cricket club. Club members leased a piece of land adjacent to the South Inch, known as the Recreation Grounds, which became the club's first home. After several decades – and regular problems with flooding – it became clear they had outgrown those grounds so, in 1924, they moved to the other side of Perth and built Muirton Park, which would serve as their home for the next 65 years. St Johnstone made their debut appearance in the Scottish Cup in the 1886–87 tournament but were defeated 7–1 in a first round replay by the Erin Rovers club, also based in Perth, after a 3–3 draw at home. In the 1910–11 Scottish Division Two season, Port Glasgow Athletic F.C. finished next to bottom and declined to apply for re-election. They were replaced for the 1911–12 Scottish Division Two season by St Johnstone, who finished fifth in their first season with ten wins and eight defeats. St Johnstone were promoted to the old First Division in 1924–25, by winning the Second Division title, and appointed David Taylor as team manager. They remained in the top flight until 1929–30 when they finished bottom of Division One. Two years later, under new manager Tommy Muirhead, the Saints were runners-up in Division Two to gain their second promotion. They performed well in Division One through the 1930s, reaching the semi-finals of the Scottish Cup in 1933–34 and finishing fifth in 1934–35. In the final season before World War II, St Johnstone played well under manager David Rutherford to finish eighth. The Scottish Football League suspended competition for the duration of the war but sixteen clubs were able to form a regional Southern Football League that managed to operate each season. St Johnstone were closed for most of the war and lost their top flight status as a result. The Southern Football League continued through the post-war 1945–46 season but with two divisions to incorporate clubs that were restarting, including St Johnstone. The Saints played in the 1945–46 B Division and finished sixth of fourteen clubs. When the Scottish League restarted in 1946, the Southern League set-up was used as the first post-war competition, so the A Division became the new First Division and the B Division the new Second Division. St Johnstone had lost all the ground gained in the 1930s and could only finish ninth in Division Two in 1946–47. Jimmy Crapnell became the team manager for the 1947–48 season and was succeeded by Johnny Pattillo for 1953–54. The Saints remained in the Second Division throughout the tenures of these two managers. Bobby Brown took over in the summer of 1958 and, in his second season 1959–60, the club finally won promotion again. Brown and his successor Willie Ormond both managed Scotland after leaving St Johnstone. In 1970–71, under Ormond, Saints finished third in the league and qualified for the 1971–72 UEFA Cup. The club historically has had little success in national competitions. Prior to winning the Scottish Cup in 2014 its only cup successes were limited to successes in the Consolation Cup – a competition for clubs knocked out of early rounds of the Scottish Cup – in 1911 and 1914. The club have also appeared twice in the Scottish Challenge Cup final, losing 1–0 to Stranraer in 1996, and winning the trophy in 2007 with a 3–2 victory over Dunfermline. Saints' Scottish Cup win came after seven semi-final appearances dating back to 1934. They have never won the top league. There have been two appearances in the final of the League Cup, losing first to Celtic 1–0 in 1969 and 2–1 to Rangers in 1998, with Canadian internationalist Nick Dasovic scoring for Saints. In terms of the league, the club's highest-ever finish has been third place in the old First Division, which occurred on three occasions. The first was in 1970–71, when Saints finished behind Celtic and Aberdeen but ahead of Rangers. The team was mostly the 1969 League Cup team, managed by Willie Ormond, who eventually went on to manage Scotland. The club had some notable players during this period, who later went on to success at other clubs – such as Henry Hall, Alex MacDonald, John Lambie, John Connolly, and Jim Pearson. This third-placed finish led to a European adventure in the UEFA Cup, beating German giants Hamburger SV and Hungarians Vasas Budapest before finally going out in Yugoslavia to NK Zeljeznicar Sarajevo. The club continued to play in the top division of the Scottish Football League until reconstruction in 1975, but were relegated from the new Premier Division in its first season. McDiarmid Park's south stand is named the Ormond Stand in his honour. It took Saints until 1983 to return to the top flight – albeit for a single season – before setting a record through suffering two successive relegations in 1984 and 1985. They eventually found themselves bottom of the entire league in 1986 and skirted with financial oblivion, before local businessman Geoff Brown stepped in. An unprecedented change in the club's focus occurred over the next decade or so, with the move from long-term home Muirton Park to the new purpose-built McDiarmid Park on the outskirts of the city, the first purpose-built all-seater stadium built in the United Kingdom. The new stadium was named to recognise the donation of land by local farmer Bruce McDiarmid. This plus the input of significant transfer funds and the appointment of manager Alex Totten spurred Saints through the leagues. They obtained promotion to the First Division in 1988. Saints then won the First Division championship and promotion to the Premier Division in 1990 during the first season of football at McDiarmid Park. Saints finished 1990–91 in 7th place, but their season was buoyed by an appearance in the Scottish Cup semi-finals, in which they lost to Dundee United. The following season proved to be Totten's last at the helm, an eighth-placed finish bringing to an end his five-year reign as manager. He was succeeded by John McClelland for the 1992–93 season. The Irishman didn't fare much better, however, leading the club to 6th place. Another semi-finals cup appearance, this time the League Cup, sweetened the campaign slightly. St Johnstone's four-year run in the Premier Division came to an end in 1993–94, a 10th-placed finish sending them back to the First Division. McClelland left the club before the season ended, and was replaced by former Dundee United striker Paul Sturrock. Under Sturrock's stewardship, more emphasis was placed on the club rearing its own players. This bore fruit in the form of Callum Davidson and Danny Griffin. Sturrock also introduced – at least in principle – the concept of morning and afternoon training sessions in an attempt to raise the fitness level of his players. In Sturrock's first full season in charge, Saints finished 5th in the First Division and reached the quarter-finals of the League Cup. In 1995–96, he led them to fourth place and a Scottish Cup quarter-final. League success returned in 1996–97 with the First Division championship and a return to the top flight. The club more than held their own in the first season back. Their 5th-placed finish meant they became founder members of the SPL the following season. Although Sturrock soon left for Dundee United, the club found a second 'golden period' in 1998–99 under new manager Sandy Clark, when the club finished third in the SPL behind Rangers and Celtic. Saints also reached the final of the League Cup and the semi-finals of the Scottish Cup in that season, losing to Rangers in both competitions. They lost to Rangers in five of the six meetings between the two clubs that season (including a 7–0 home defeat), but Saints won 3–1 in the other game. Their finishing position in the league meant Saints had qualified for the 1999–00 UEFA Cup campaign. They started with a 3–1 aggregate win in the qualifying round over Finnish side VPS Vaasa, but were beaten 6–3 on aggregate by French giants AS Monaco in the first round proper. The return leg meant that international stars such as Fabien Barthez, John Arne Riise and David Trezeguet played at McDiarmid Park. St Johnstone remained unbeaten at home in European competitions until their tie against FC Minsk in 2013. After a period of steady decline, the club were eventually relegated from the Premier League in 2002. Clark's replacement, Billy Stark, oversaw this relegation, and left the club in 2004 after two seasons of varying success. With the club in eighth place after a poor 2004–05 season under Stark's replacement, John Connolly, Owen Coyle took charge in April 2005, ushering in a promising new period in which St Johnstone earned second-place finishes in 2005–06 and 2006–07. There was also cup success under Coyle. On 8 November 2006, St Johnstone beat Rangers 2–0 at Ibrox to reach the semi-finals of the League Cup. Steven Milne scored both of the goals. This was the club's first victory at Ibrox since April 1971. It was also the first time the club beat Rangers in a cup competition, and the first time that Rangers had been eliminated from a major cup competition at home by lower-division opposition. On 31 January 2007, Saints were knocked out of the League Cup at the semi-finals stage by Hibs. On 14 April 2007, St Johnstone were beaten 2–1 by Celtic at Hampden in the semi-finals of the Scottish Cup. By then Coyle's name was being linked with managerial vacancies in the SPL. On 21 April 2007, second-placed Saints won 3–0 at home to Queen of the South, while table-toppers Gretna played out a goalless draw against the visiting Clyde, which put the Perth club just one point (and seven goals) behind Gretna. As a result, the First Division championship was to be decided on the final day of the season. Seven days later, St Johnstone were pipped to the First Division championship by Gretna, who had led the division for the majority of the season. Saints won 4–3 at Hamilton Academical, but James Grady scored an injury-time winner for Gretna at Ross County minutes after the St Johnstone game had finished. The results maintained Gretna's one-point lead and they achieved promotion to the Premier League under former Saints player Davie Irons. Owen Coyle left the club on 22 November 2007, to become manager of English club Burnley. Saints next game, the Challenge Cup Final against Dunfermline three days later, saw them win their first cup since the Scottish Consolation Cup of 1911, with a 3–2 victory. St Johnstone midfielder Derek McInnes was appointed as Coyle's replacement as manager on 27 November 2007, after Coyle's assistant, Sandy Stewart, who had been in charge in a caretaker-manager capacity for the Challenge Cup Final, decided to follow Coyle south to Burnley. McInnes began as a player-manager. Results to the end of 2007 continued the indifferent form shown under Coyle, leaving St Johnstone in third place, some way behind the leaders. In 2008 the club did, however, reach the semi-finals of the Scottish Cup for the second consecutive season, losing out to Rangers on penalties after extra time. It was the club's seventh appearance in the semi-finals, and their seventh defeat. On 2 May 2009, Saints beat Greenock Morton 3–1 at McDiarmid Park to clinch the First Division title and a return to the Premier League after a seven-year absence. They finished eighth in their first season back. In November 2011, on the same day the club announced the appointment of manager Steve Lomas, it was also announced that club chairman Geoff Brown, the longest-serving chairman in Scottish football, was retiring and therefore stepping down from his post. His son, Steve, was handed control of the club. In June 2013 Steve Lomas left the club to manage Millwall and Tommy Wright was appointed as his replacement. In his first competitive game in charge, Wright lead St Johnstone to a 1–0 victory against Rosenborg BK in Norway. This was the club's first away win in Europe in over 40 years. On 13 April 2014, St Johnstone reached their first-ever Scottish Cup Final, after defeating Aberdeen 2–1 at Ibrox Stadium. They won the final against Tayside rivals Dundee United on 17 May, 2–0 at Celtic Park. St Johnstone have qualified for the UEFA Europa League (formerly the UEFA Cup) on seven occasions. The furthest they have progressed is the third round, which occurred in 1971–72, their debut season in the tournament. St Johnstone share a Tayside rivalry with both Dundee and Dundee United. It was against the former on New Year's Day 1997 that they recorded their biggest league win in recent memory, 7–2. For a list of all St Johnstone players with a Wikipedia article, see Category:St Johnstone F.C. players. In October 2013, the club inducted the first five members to its "Hall of Fame" intended to formally recognise those who have made a significant contribution to the club. Those inducted were John Brogan, Joe Carr, Willie Coburn, Roddy Grant and Henry Hall. The inaugural event took place at a dinner ceremony at Perth Concert Hall. St Johnstone have had 24 managers in its history. The longest-serving manager was David Rutherford (11 years), although his tenure was interrupted by the Second World War. The club has, on average, appointed a new manager every four years. Willie Ormond and Bobby Brown both left "Saints" to manage the Scotland national team. Prior to Peter Grant's appointment in 1919, the team was picked by committee – a practice in wide use at the time. Bannerman, Gordon (1991). Saints Alive! St Johnstone Football Club Five Years on a High. Sportsprint Publishing, Edinburgh. ISBN 0-85976-346-3. Blair A, Doyle B (1997). Bristling with Possibilities: The History of St Johnstone F.C. Blair, Alastair (2003). St. Johnstone FC (Images of Sport). Tempus Publishing, Limited. pp. 128pp. ISBN 0-7524-2183-2. Blair A, Doyle B (2015). Manifest Destiny: The History of St Johnstone F.C. McLaren, G (2001). Of Saints & Foxes. G McLaren. ISBN 0-905452-99-2. The story of Sandy McLaren (St Johnstone, Leicester City and Scotland national football team goalkeeper), written by his son. Slater, Jim. Who's Who of St Johnstone 1946 to 1992. ^ "St Johnstone Football Club". Scottish Professional Football League. Retrieved 30 September 2013. ^ "St. John's Kirk, Perth – Welcome". ^ Ltd, Statto Organisation. "St Johnstone results for the 1886-1887 season - Statto.com". ^ Ltd, Statto Organisation. "St Johnstone Home Page for the 1911-1912 season - Statto.com". ^ St Johnstone 3–1 Rangers, Soccerbase. ^ "BBC SPORT – Football – Scottish Cups – Rangers 0–2 St Johnstone". ^ "BBC SPORT – Football – Scottish Cups – St Johnstone 1–3 Hibernian". ^ "BBC SPORT – Football – Scottish League – Gretna 0–0 Clyde". ^ "BBC SPORT – Football – Scottish League – Hamilton Accies 3–4 St Johnstone". ^ "BBC SPORT – Football – Scottish League – Ross County 2–3 Gretna". ^ "BBC SPORT – Football – Scottish Cups – Dunfermline Ath 2–3 St Johnstone". ^ "St Johnstone 3–1 Morton". BBC Sport. 2009-05-02. Retrieved 2009-05-26. ^ "St Johnstone 2–0 Dundee United". Daily Telegraph. 17 May 2014. Retrieved 21 May 2014. ^ Known as the Second Division prior to 1975. ^ "B Division Supplementary Cup". SFHA. Retrieved 6 November 2013. ^ "Consolation Cup Finals (1907–1914)". RSSSF. Retrieved 21 February 2014. ^ "St Johnstone – Historical Football Kits". Wikimedia Commons has media related to St. Johnstone F.C..